Martin Roll delivered an executive program on 26 February 2018 at the Moscow School of Management Skolkovo in Russia about business strategy, effective brand building and globalizing Russian brands. The session was attended by MBA and EMBA students. Founded in 2006, the Moscow School of Management Skolkovo is one of the leading private business schools in Russia and the CIS. The business school offers programs for businesses of any type and size – from startups to large multinational corporations. This includes MBAs, EMBAs, entrepreneurial and senior executive programs to accelerate current projects or start new businesses, practicum for directors and solution development workshops. Martin Roll opened up the executive program with a powerful quote by Infosys founder and mentor Narayana Murthy: “To succeed in the global bazaar requires a global mindset”. During the interactive 1-day executive session which included breakout discussions, Martin Roll discussed what it takes to globalize a Russian brand, how to strategically transform a company for global expansion, and how branding and marketing can help Russian companies to maneuver new markets. Next generation leadership: Leadership is rising up the management agenda in the age of brand building today. Leadership in the 21st century will be influenced by constant change, geopolitical volatility, technological disruptions, and economic and political uncertainty. Therefore, Russian companies aiming at building and sustaining successful brands must ensure that next generation leaders are well-equipped to navigate these major forces of rapid and influential global change. Companies must ensure that everyone in the company is properly aligned with the brand values with the right mindset and belief. The entire company and its multiple and cross-functional actions and activities should be channeled towards this goal. The CEO and the entire executive management team are very important stakeholders to make this happen successfully. Giving the Chief Marketing Officer a seat at the boardroom: The role of the Chief Marketing Officer (CMO) continues to evolve as the marketing function becomes more strategic but also equally complex and challenging. Traditionally, most brands have faced the problem of being run by marketing departments and being too focused on marketing as a functional and executional role. Brands must be run at the boardroom level and be an integrated part of all strategic issues. Running a purpose-driven business: Next generation boards need to drive an “outside-in” market engagement approach. Traditionally, businesses used to only analyze the market and determine an offering. Today, that alone is insufficient. Companies need to also establish a purpose – a clear view of what it will bring to the world, why it will matter, how it will deliver on that promise. This means creating clarity of the brand’s core mission, defining a shared vision and leading relentless execution of the brand strategy. Nonetheless, achieving the above is not a position that comes easily. It requires full attention and hard work over a long period of time and attention to every detail. LEGO’s turnaround towards becoming the most valuable global toy brand is a good example. When a nation has a strong and positive brand in the international arena, it will be more attractive to tourists, skilled workers, and investments. It will also be more resilient to financial crises and be better able to sustain higher prices. Businesses will also benefit from positive country-of-origin effects, a halo effect on its products, and an increased ability to export. Martin Roll discussed the example of Swedish furniture & home accessories brand IKEA. The iconic Swedish company founded by Ingvar Kamprad is doing more for the image of Sweden than any governmental efforts combined. Another example is the admired Thai destination brand (referred to as “Amazing Thailand”) that is a result of bold Thai governmental decisions to invest in and build the tourism ecosystem in the country over several years. Amazing Thailand has had a profound impact on the country’s economy. Martin Roll introduced the global business strategy framework where long-term value is created by business and brand drivers. Business drivers include structure, strategy and execution while brand drivers include intangibles, a brand narrative and good brand governance. Supporting all of these drivers is the role and importance of good leadership. Understanding what drives the creation and transformation of brands is key to evolving and maturing them. A classic example of brand transformation is how Asian companies used to be known for manufacturing consumer goods cheaply for Western companies. Today, many Asian products are no longer associated with low-cost and considered inferior to Western products and brands. 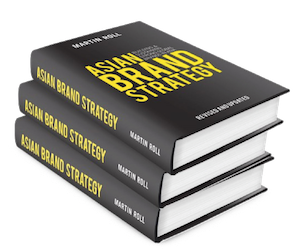 In the past 10 years, Asian firms have realized that they need to move up the value curve and one way to do that is to build their own brands and even premium brands. To do this, Asian brands have to truly differentiate themselves from the other brands in the global marketplace. There are a handful of Asian brands which have managed to gain sophistication and succeeded in competing effectively on the global level. Asian brands like Singapore Airlines, Huawei, Uniqlo and Samsung have done well in global markets and should serve as inspiration for other Asian companies aiming to go global. Martin Roll gave a few examples of Asian companies who have managed to successfully achieve breakthrough – Jim Thompson, the Thai Silk Company originating from Thailand. The brand, built on a strong myth with a modern twist, has been able to maintain its differentiation. It is perceived to be highly authentic, to have high quality and a strong heritage. French luxury brand Hermès has an uncompromising attitude towards quality and is a very high-end, authentic brand with a strong legacy and heritage. The aura of exclusivity around the brand is a result of its philosophy and aim to always remain “ultra-premium luxury” – to be afforded by only the very few and not be easily available. Korean beauty company Amorepacific is also another Asian company on the way to becoming a global beauty behemoth with a brand portfolio competing on innovation, quality, marketing and authentic Korean cool. Similar to how Paris and New York are symbolic global capitals of beauty, so much of Amorepacific’s rapidly evolving brand equity is due to its country of origin. One major reason being that Korea is now very much perceived by Asian women to be the role model for Asian beauty. For an organization to truly be brand focused, it needs to start a journey to launch brand management initiatives and track the outcomes of related efforts. This can include a branding or brand process alignment workshop, examining the internal and external brand communications, aligning employment policies to the brand, running training and development programs, and more. The bottom line is that brands are strategic assets for successful companies and it is vital for companies to start their journey towards sustaining a commitment towards branding. One Asian brand that understands the importance of branding and has reaped the fruits of its labor is Singapore Airlines (SIA). It is one of the most iconic Asian brands with technology and service as its key drivers. It is a great example of how the brand promise and brand delivery has been well-balanced and managed since the airlines’ inauguration in 1972 in Singapore. The brand promise of “A Great Way to Fly” with its emphasis on service and technology excellence has long served the airline very well and has been consistently communicated since the start. In addition, Singapore Airlines runs one of the most comprehensive and rigorous recruitment and training programs for cabin and flight crew in the industry to make sure the SIA brand experience is fully and consistently delivered. The training program for new crew is 15 weeks long – twice the length of the typical programs in the industry. This has resulted in numerous awards and recognition for its service excellence and well-trained staff at all levels.